Our people are so important to us as both the faces of Bliss in our beautiful Bali Women’s Retreats and behind the scenes. Zoë has spent a lot of her time hand picking exactly the right staff and hostesses to look after you during your stay. Every person working at Bliss does so with love, kindness and nurturing at the forefront of what we do. If a meal isn’t as good as it can be, we let the staff know it doesn’t have enough love in it. If we inspect a room and find some things not quite right we ask them to put more love into it and guide them. Our amazing hostesses all speak fluent English and our staff are all Indonesian. We don’t separate our people from our product, which means we don’t hire villas that just come with staff. We train and mentor all of our own staff. Bliss is more of a family. We take care of each other, help each other, we’re there for each other. All of our Balinese staff have been with us for a long time and we are growing every year and adding more and more wonderful souls to our team. Our hostesses are handpicked by Zoë with an emphasis on their ‘can do’ attitude, empathy, caring and ability to get things done. A lot of love and care goes into the selection process and we choose amazing Indonesian Women with great English to look after our guests who are smart, empathetic and full of love. 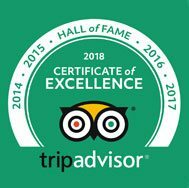 Each of them have contributed positively to Bliss in their own way and we take great pride in helping to empower Indonesian women in management roles caring for our guests which they excel at thus earning us the coveted best Cultural Retreat in the world title (World Luxury Hotel Awards – Best Luxury Cultural Retreat, Global). Ayu is one of our lovely Hostesses who will welcome you to Bliss. 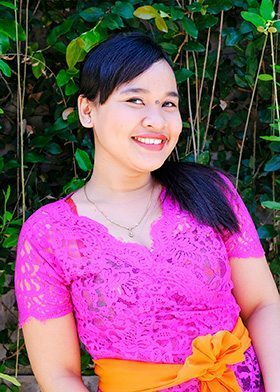 With a background in customer service, Ayu worked for 7 years as an event co-ordinator at a hotel resort on her Balinese home island of Nusa Lembongan. 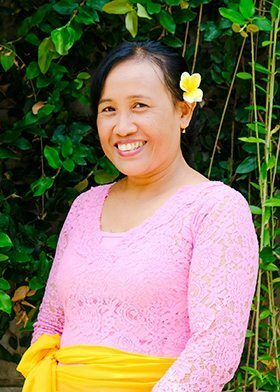 She is great at scheduling all your activities and making sure you get to do and see everything on your wish list whilst in Bali. If relaxing around the pool and enjoying unlimited yoga and massages is what you’re looking for- Ayu will be able to organize all your treatments so you don’t have to worry about a thing at Bliss. Balinese born and raised, after high school Ririn studied at the university in Denpasar. Working and studying simultaneously to pay for her University fees she completed her accounting degree in four years. Ririn has worked in accounting and administration and is now our operations assistant, working behind the scenes to help operations at Bliss flow effortlessly. Ririn works between the different Sanctuaries and you may see her doing daily offerings in her traditional Balinese clothing. 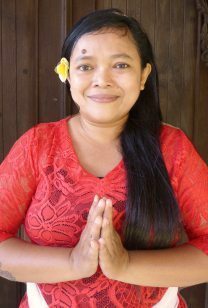 Balinese born, Ani is our beautiful Hostess who will welcome you with open arms. With a background in hospitality working as a receptionist and in guest services in the hotel industry, Ani loves to connect with our guests from all over the world. Ani is married and is the mother to two gorgeous children and her motherly love shows through her connection to our guests at Bliss. Ani loves being apart of the Bliss Family and is excited to connect and help make your stay one you won’t forget. Alit has been a part of our family right from the very beginning when Bliss Sanctuary for Women opened over 6 years ago. Alit is head of the kitchen and leads her team with her great work ethic, fantastic knowledge of Balinese flavours and passion for creating hearty, nourishing meals. Alit’s English is perfect and she can discuss with you any food preferences, requests or allergies you have. All her food is cooked with love and will get your tastebuds tingling with excitement from the fresh, local dishes. Amik is another one of our beautiful kitchen and Housekeeping staff and has been working with us for just over a year. Before joining the Bliss Family, Amik was working in administration in the finance industry. Amilk is married and has a young daughter. 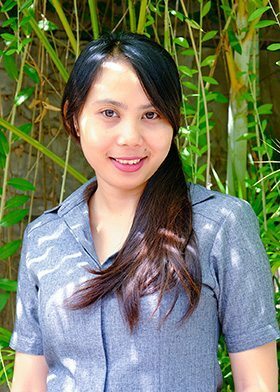 Although her English is minimal she has the friendliest smile and will welcome you with her warm presence. You will always find Trisna laughing in the kitchen and she will surely make you feel loved and looked after. 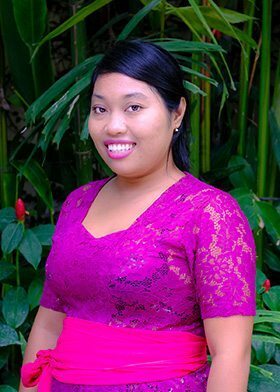 Trisna was born and raised in Bali and has been working in different restaurants for the past 3 years before joining the Bliss family. She has a bubbly, outgoing personality and a beautiful smile. Her English has improved whilst working at Bliss and she loves to have a chat and connect with all our guests. Mega leads our beautiful massage team, with an open heart and her strong work ethic. 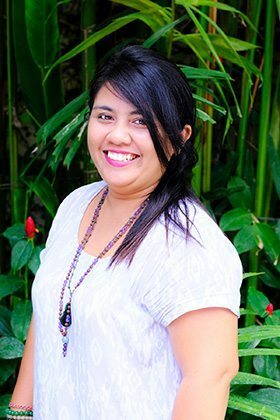 She lived in Australia for two years where she trained as a masseuse, and has since come back to her native Bali to pursue a career in spa treatments. Her English is perfect, and all the guests love her kind and loving attitude. Mega loves to connect with our guests while she gives you a beautiful manicure and pedicure or reflexology. She loves sharing about life in Bali and you will feel her love, coming straight from her heart! A mother of a beautiful baby boy, everyone loves her! 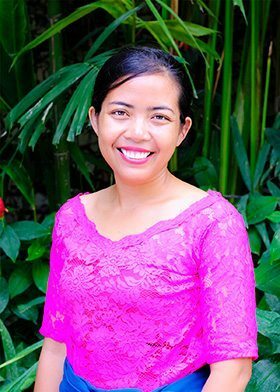 Originally from Bali, Kadek has trained and worked as a masseuse for over 5 years, leaving a career as an accountant behind. A mother of three grown up sons, (who also love her massages) Kadek’s kind and motherly energy is loved by all. Her treatments are excellent, especially her hot stone treatment, which is a favourite one amongst many of our guests! Those who love strong massages, love Kadek as she knows just how to get those tough knots in your back and shoulders to magically disappear. Originally from the neighbouring island of Java, Tini, is a single mum to a beautiful baby girl. 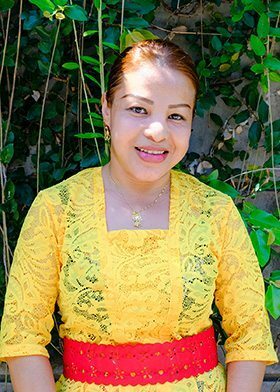 Tini joined our Bliss team after 5 years of experience working as a masseuse and many guests comment on how much they love her Balinese and Thai massage! Although a bit shy, she connects with all the guests through her loving touch and warm smile! Tini’s manicure and pedicures are also beautiful- especially when she paints the tiny colourful flowers on your nails- a definite must try in Bali. Putu is one of our main drivers at Bliss and feels like a responsible brother when taking you out for day trips or driving you around the island to explore. 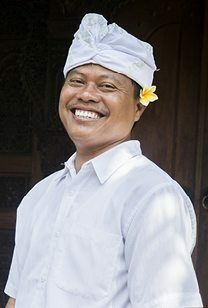 A native of Bali, his knowledge of the island and all its popular spots and secret corners is profound, he is one of the best tour guides you could ask for! His English is perfect, and a day spent sightseeing with him is truly an amazing experience. All the guests love his safe, calm and knowledgeable approach to the busy Bali street traffic! Made is our other main driver and is well loved by all of our guests. With a large choice of music, a bubbly energy, amazing English and a vast knowledge of Bali, you will definitely enjoy driving with Made. He has the ability of making a long drive to see beautiful sights the most entertaining experience and if you’re looking for fun you’ll be able to sing at the top of your lungs with him and have many laughs, thanks to his witty personality. Made is married to a beautiful wife and is a father to a little boy, with another baby on the way. 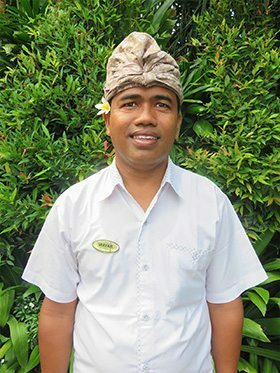 Sri is originally from Bali and is our main gardener. She takes wonderful care of our lush tropical gardens with her loving heart and hands! A single mother of 2 boys and a holy woman in her village, she also makes sure that the Hindu altar at the villa is properly attended to. She makes the daily offerings around the Sanctuary for spiritual protection and while she doesn’t speak much English, she will always greet you with a warm, large smile. 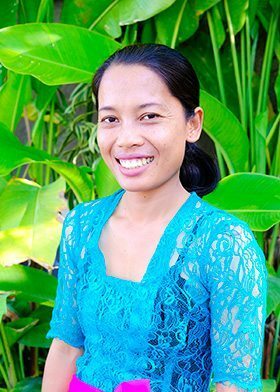 Originally from the neighbouring island of Java, Yuni joined our team as an assistant gardener, and an additional help to out housekeeping team. Yuni makes sure the gardens are looking lush and beautiful and is always available to help out wherever needed. Her English is limited but with her beautiful smile and open heart you will always feel welcomed by Yuni and she is a huge asset to our team! 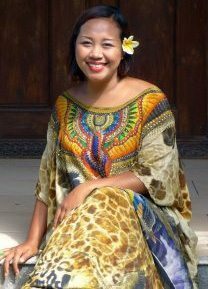 Originally born in Denpasar, Bali, Widya is our other Hostess at Bliss Sanctuary for Women. 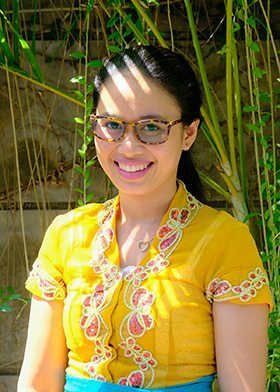 Widya studied at University in Bali for 3 years and has a Diploma in Hotel Tourism. Over the years she has worked as a cook, waitress, manager, receptionist and spa therapist- She really has done it all! She has enjoyed working in Singapore and Turkey but most of all, loves her native Island, Bali and is excited to share all her knowledge with our guests. We love our only Grandmother on staff Viko. 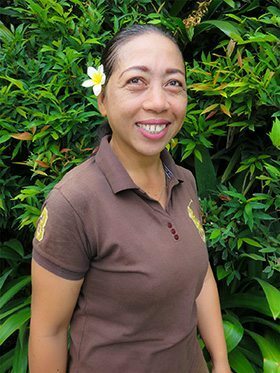 This bubbly, smiling, beautiful Balinese woman has joined the team in 2015 after housekeeping at various villas in Bali. She has learnt to cook as part of her job at Bliss and now cooks the best Beef Rendang, which guests love. Viko is a valuable member of the team, always smiling and wanting to do a great job, infusing so much of her motherly love into everyone she meets. 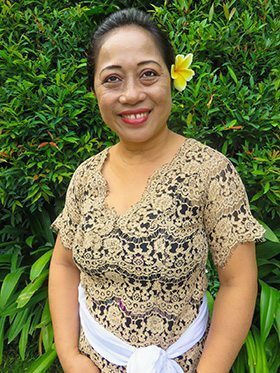 Originally from the neighboring island of Java, Popy, a single mother to one lucky boy, has been living in Bali for the last 6 years where she studied massage and reflexology. Popy used to work as a very busy and popular freelance massage therapist prior to joining Bliss. She used to freelance with us from time to time and the guests and Zoë loved her so much we offered her a full time job. Luckily the feeling was mutual and she joined us in 2014. As head of the kitchen at Canggu and our head trainer for all new staff, Riska has proven herself to be an extremely valuable member of the team with an amazing work ethic. She has very good English after traveling to many overseas countries for work. Like all of our staff Riska takes great pride in her work. She is very proud that thanks to so many generous tips from our lovely guests she has been able to buy her own home in Java which she will one day retire too. This is a huge thing for Indonesians who are rarely able to own their own homes and look after their families in this way. Another amazing masseuse, Vera has many fans in past guests who love not only her massage but her stories and hilarious expressions. Her eyes open so wide and she laughs with every aspect of her being. Due to her husband’s lineage, Vera and her husband have recently been escalated to ‘Holy’ man and woman of their village. 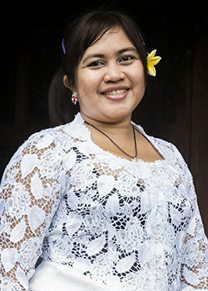 Vera has one son, loves her job and is best friends with Wayan, an extension of her family. Another one with magic hands and now ‘holy hands’ also. Komang is our gardener, security and general caretaker. 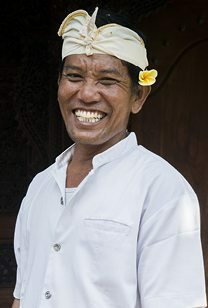 Komang speaks very little English but he has a huge smile and is usually there in the garden or cleaning the pool when you wake up in the morning. His wife, daughter and 2 sons live about a 2 hour motorbike ride away and he visits them once a month. Komang lives next to the villas and we are so thankful to have him there 24/7 feeling safe in his capable hands. Ketut is our head driver and we feel very safe with his careful and knowledgeable driving. He has such a high moral character which he offsets with a great sense of humour, huge smile and love of the band ‘Roxette’ which you will hear most days in his car as he hums along. There have been many sing-alongs in Ketuts car, but most of all he is so careful and caring of our guests. 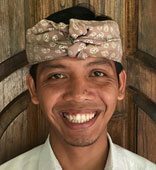 Ketut loves working at Bliss, and takes great pride in his elevated charge of caring for women. Ketut is a father of 2 boys and husband to a wonderful wife. He holds a highly esteemed place in his village as the go-to person for any issues – akin to a Priest looking after his congregation. We feel very safe and cared for in Ketut’s hands. Nur is the newest member in our gardening team and she takes great pride in ensuring the gardens look beautiful and lush. 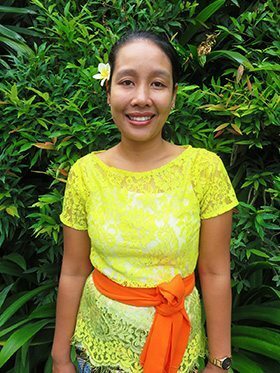 Originally from Java, Nur moved to Bali when her sister Viko (kitchen/housekeeping) found her the job at Bliss. 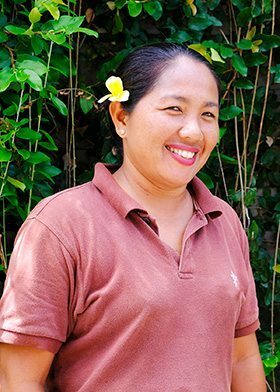 Nur is a single mother to two children and she always has a smile on her face when she works outside, maintaining the grounds, keeping Bliss Sanctuary beautiful and green. Our original masseuse Wayan was the first masseuse Zoë ever hired and is still with us in Canggu today. Wayan has been massaging for over 15 years and also did high level training for different spas she used to work for. Since becoming a mum Wayan has loved working at Bliss with a more flexible approach and family feel. She has magical hands and is especially good at the Thai Massage. You can also see Wayan on some of the videos on our facebook page. Riani is a new addition to our Bliss Family. 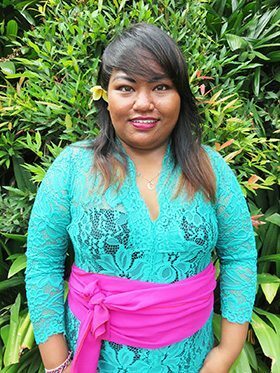 She was born in Bali and after years in the hospitality industry as a cook, she joined us at Bliss Sanctuary in May 2017. Riani is married and has 2 beautiful children and she absolutely loves working at Bliss and meeting guests from all over the world. With her caring personality she always gives our guests so much love and cooks from the heart. 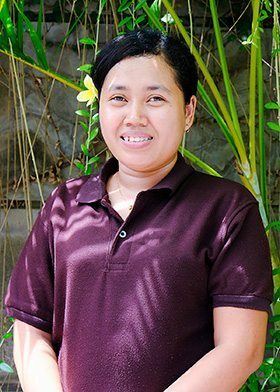 Erma is one of our lovely kitchen/housekeeping staff and joined the Bliss family in 2015. 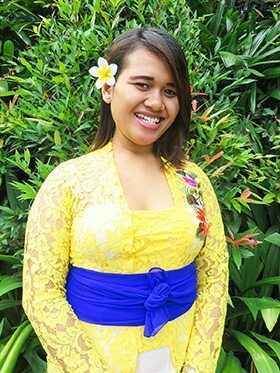 Born in Bali, she started working in hospitality straight after finishing high school. Erma is only 24years old and has a lovely gentle personality, cooking from the heart and ensuring the Sanctuary looks beautifully looked after.  Dwik is another new team member at Bliss and joined us in 2017. She has been working as a spa therapist for over 5 years and has even worked as far away as Russia!. 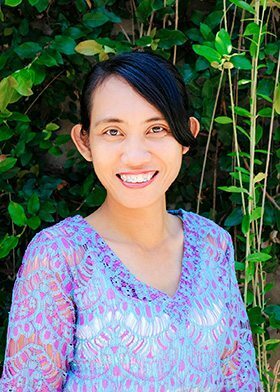 Although her talents have allowed her to travel afar, Dwik decided to move home to Bali to be closer to her family. She loves to connect with our guests from all over the world and help them find true relaxation, here as Bliss Sanctuary. Wayan is one of our main drivers and will greet you with a caring, gentle spirit. 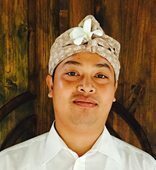 He has worked in the hospitality industry for 10 years as a driver and knows all the best routes to take to avoid Bali traffic. Many guests comment how kind Wayan is and feel very safe and looked after when driving with him. He enjoys connecting with ladies from all over the world and enjoys sharing stories about Bali; it’s culture and life. Infused with kindness, caring, empathy and pride. We love and care for each other deeply and we do the same for you. All of our hostesses and management are chosen with love care and attention.